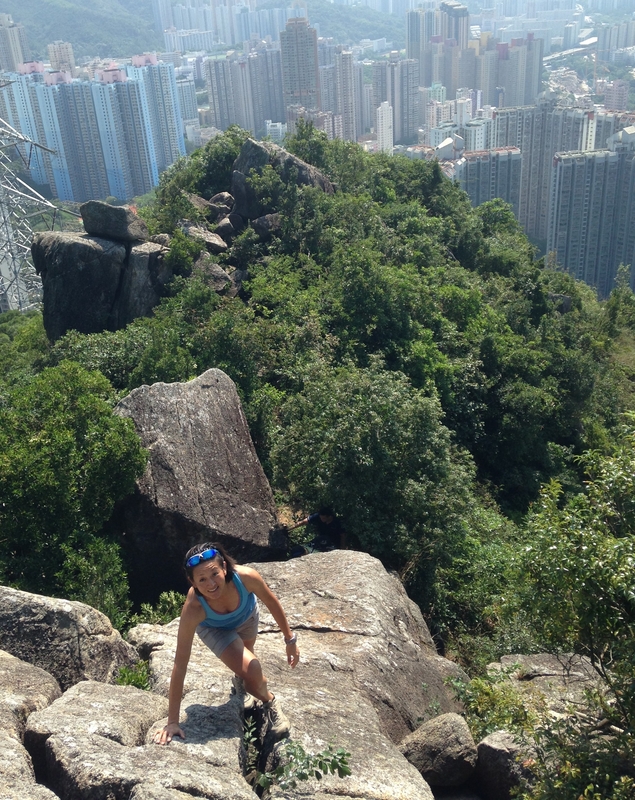 I am always amazed at how many great walking, trail running and other outdoor possibilities there are in Hong Kong and how easy it is to get to and from them. 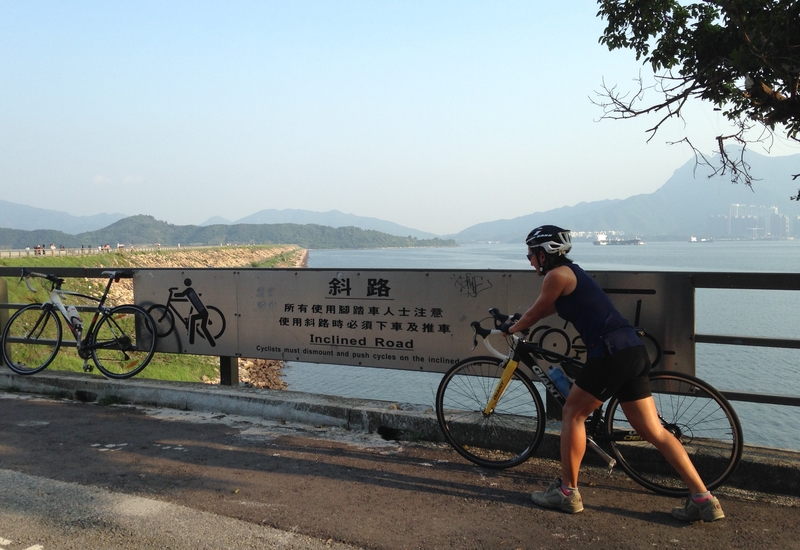 In the space of four days in early October we did two runs, a fantastic gorge walk and went on our first Hong Kong bike ride. Our first run (around the Shing Mun Reservoir and then mainly on the Wilson Trail to the Kowloon Reservoir) was on a cloudy and drizzly day. However, it was still nice to be out in the countryside and we saw a wild pig for the first time and also came across a pack of wild dogs. These seem to be a new addition to the local fauna as previously they seemed to just hang around old abandoned villages. Their rivals for top scavenger, the monkeys, were still there although did not seem as numerous as I remembered. The place where we finished the walk/run (Tai Po Road) was close to where I lived from 2 to 5 years old, so it definitely felt like coming home. We got back to where we were staying, which was in the middle of Kowloon near Mong Kok, after only a 10 minute bus journey. The following day, having had a couple of delicious, but very calorific meals out (thanks to Lillian’s parents) we felt like getting back on our bikes, or more accurately some rental bikes. We got these from a shop in Fo Tan (the next stop on the train from Shatin) and took the cycle path to Tai Po, a town which is further up the coast. To our surprise the path was good to ride along and, on a weekday, not too busy. It was very scenic even though we were skirting some big housing developments and were essentially on the coastal side of the main road. From Tai Po we continued towards Tai Mei Tuk which is a small village next to a large reservoir created by the Plover Cove Dam. It is actually where I lived for the first two years of my life… just a coincidence, as we had not been planning on making our trip a childhood reminiscence tour. We rode up onto the dam and chose to ignore the sign where riders were requested to dismount and push their bikes up due to the “danger” of the “inclined road” of 100 metres with a 8% gradient! However, it shows that on weekends it must get very busy with people renting bicycles, which is understandable given how nice the views are on a clear day. The clear weather continued so the next day we went for another morning walk/run on the hills around Lion Rock in Kowloon. After getting out of a taxi on Shatin Pass Road, we saw a group of local hikers head off up a faint path behind the Fat Jong Temple so we abandoned our original plan and decided to follow them. 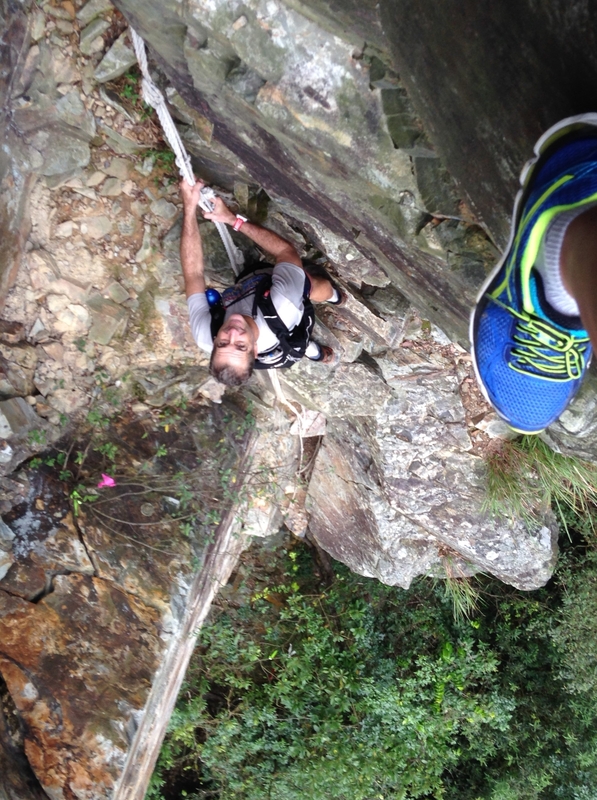 We were rewarded with a great route up a steep ridge, rocky enough in places to require some easy scrambling. It landed us on the main path to the top of Lion Rock from behind the ‘Danger – Steep Cliffs’ sign, which we had to climb under. The main path up Lion Rock was busier than we expected given it was a weekday but, nevertheless, the views never cease to be impress me. We continued along the ridge (mainly following the Maclehose Trail) and eventually ended up at the Kowloon Reservoir, which was the same finish point as on the previous walk but approached from the other direction. 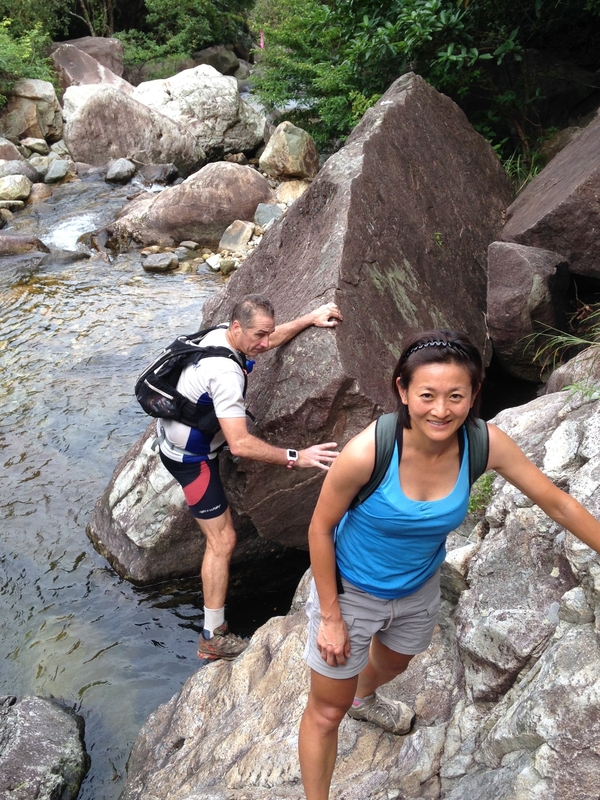 Our final Hong Kong outing was with a friend Ed, who we took up the Yellow Dragon River. 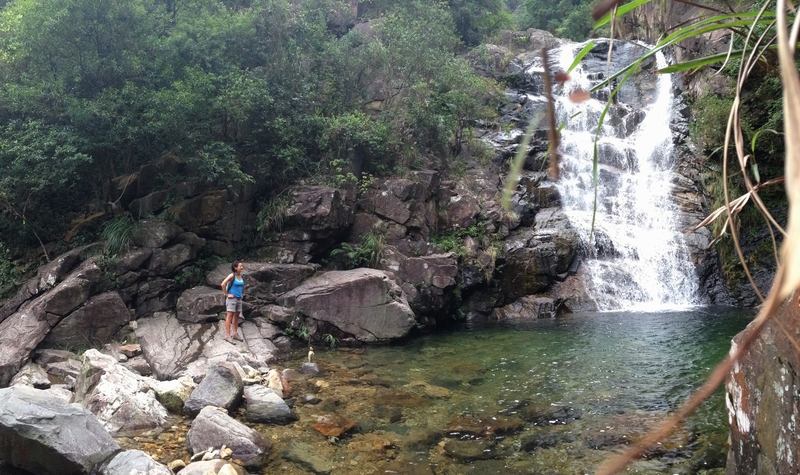 This takes you from Tung Chung (the town next to the airport) into a world of cliffs, jungle and waterfalls in the heart of Lantau Island. Twenty years ago (in pre-internet guide days), my dad discovered this gorge by following a faint trail in from the top; he then took me back the following weekend and it was like we were entering the Lost World together. A 5 minute taxi ride from the Tung Chung MTR Station took us to the road where the walk starts (Wong Lung Hang Road). Soon we were scrambling up the Yellow Dragon River that steadily got narrow and steeper as we entered the gorge. There are several waterfalls on the river itself and coming down the cliffs of the gorge. We passed the one in the photo below by scrambling up through the trees on the left hand side. After a couple of hours of scrambling the gorge narrows and there is no way onwards along the river. The path turned left and soon got to a knotted rope going up a near vertical cliff. Luckily it was not necessary to go up that; by following the ribbon markers in the trees we were able to skirt the cliffs without too much difficulty, although a slip would have had severe consequences and at one point we had to pull on some old ropes of dubious provenance. For anyone wanting to do this walk, note that the cliff is not as steep as it looks in the photo. The climb took us out of the gorge and we then had to ascend about 500m to get out of the valley. This was a hot slog through steep forest and undergrowth. At one point we came across a massive (i.e. almost the size of my hand) yellow and black spider blocking the trail; these are a reasonably common sight when hiking in the summer but it was still a bit unnerving and required a diversion through the bush. We only got a blurred photo so here is a link to a photo I found: Spider. Once out of the valley and at about 700m in altitude, we traversed onto the Lantau Trail and followed it down to Silver Mine Bay. It took about an hour to reach Silver Mine Bay where there is a ferry back to Central. It’s hard to think of many other places where you can get to and from somewhere so wild so easily. Hong Kong is just great! 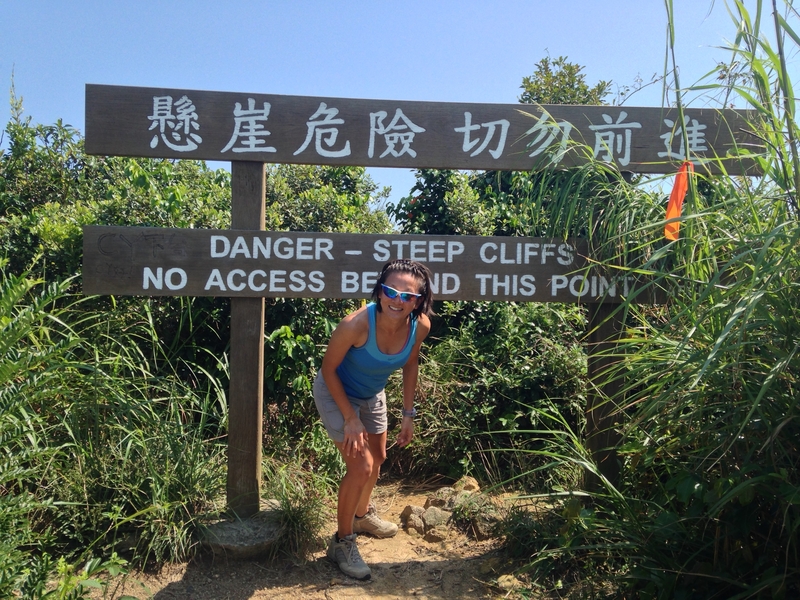 More information on this walk, with a bit of hyperbole, is here: HK Adventurer. 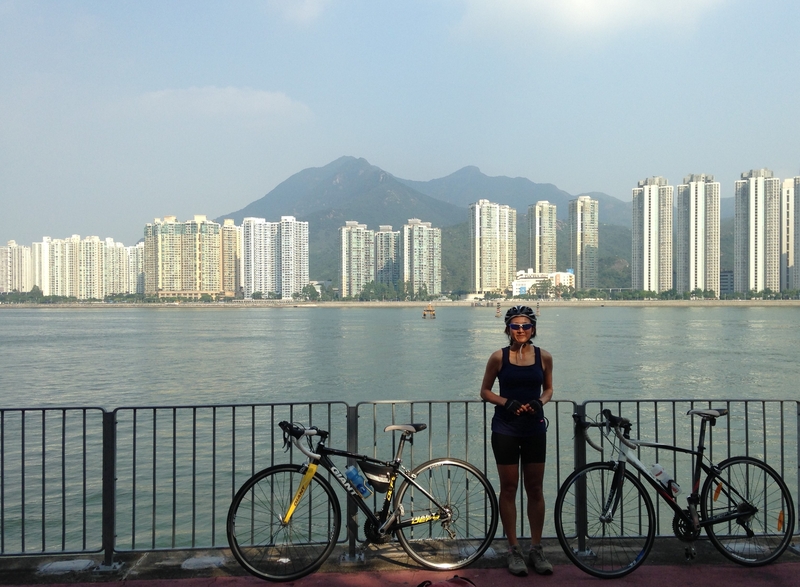 And finally, some more of our Hong Kong adventures are here: Outdoor Hong Kong (Part 2). Great write up Mark, sounds like you’re having an awesome time. It sounds like a tour guide is not necessary for the Yellow Dragon Gorge hike, is that correct? I see tours online charging HK$700. I can’t advise you on that. The river can flood if there is heavy rain and the climb out of the gorge is exposed so it could be dangerous.